An easy care orchid, Cymbidium Orchids one group that can easily be grown in the UK given the correct growing conditions. We provide notes on basic cultivation and Cymbidium Orchid photographs of various forms and colors. The cymbidium orchids that we commonly see for sale are far removed from the original species found from India through asia to Australia. These hybrids are a wonderful orchid for new growers, a good indoor plant in UK conditions, but hardy enough to cope with outdoor conditions from spring to autumn. One of the major factors in the care of these orchids is watering, they require good drainage. Light is the second factor, filtered light rather than direct sun, although they will grow in full sun. ANd thirdly they require a cold winter to spark them into flowering mode, not something we have much trouble with in the UK. However they do not like frosts. 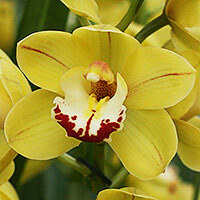 Cymbidium Orchids are one of the easiest and forgiving orchids to grow. They do best where nighttime temperature does not drop below 50F or 10C. In the UK Cymbidium Orchids are best grown in a conservatory, controlled greenhouse or they can be grown inside in a well light and well ventilated position at home. Remember that new growth is triggered by cool nighttime temperatures during summer and spring, so if you are growing cymbidiums indoors you will need to vary the temperature. Cymbidiums like to be moist but not wet, use a fairly open potting mixture, we recommend a specialist orchid mix. 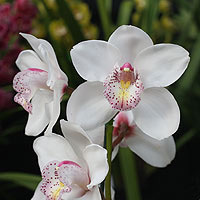 Cymbidiums will flower in the UK between May and September, remove flower spikes once flowers have died back. To repot Cymbidium Orchids wait until flowering has finished, divide leaving one of the 'back bulbs' or 'pseudo bulbs' on each division, these are the bulbs that have lost all leaves. Back bulbs act as a nutrient supply.